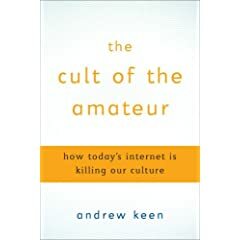 The description: In a hard-hitting and provocative polemic, Silicon Valley insider and pundit Andrew Keen exposes the grave consequences of todayÃ?Â¢Ã¢â??Â¬Ã¢â? ?Â¢s new participatory Web 2.0 and reveals how it threatens our values, economy, and ultimately the very innovation and creativity that forms the fabric of American achievement. Bloglines is a FREE online service that helps you subscribe to and manage lots of web information, such as news feeds, weblogs and audio. Bloglines tracks the information you’re interested in, retrieves new stuff as it happens, and organizes everything for you on your own personal web news page. Wirecast is the most advanced live webcasting product available for your Mac or PC. You can stream multiple live video cameras, while dynamically mixing in other media (movies, images etc). Features such as Chroma Key (blue/green screen) and built-in titles merge seamlessly with Wirecast’s layering system, allowing you to create beautiful, professional webcasts. rooSwitch exists to make it easy for you to create different profiles of almost any application’s data. You then switch amongst the profiles to activate the data you wish to use. It’s like a multi-user environment for just one application. rooVid Lite allows you to create profiles that contain the details for how you want the exported video formatted. Creating profiles is easy. Select from our pre-defined options or create a custom profile giving you all the options for exporting a QuickTime movie.